Peter Jackson‘s Mortal Engines is a visual and creative feast for those of us who love production design and giant steampunk style machines. Unfortunately, its somewhat predictable plot and characters don’t help it become a more complete film, leaving it as cold and lifeless as one of its giant rolling cities. While this might be one of the best blockbusters you would normally have in theaters at any given time, this has the unfortunate luck of being in one of the most over-saturated and competitive markets in recent memory. It’s not a bad movie, but if someone asked for a recommendation of what to check out in a theater right now, I can’t wholeheartedly endorse this. Our story, based on the novel of the same name, is about an apocalyptic future a thousand years from now where giant roaming cities practice “municipal cannibalism.” The larger cities find smaller trading posts and villages and consume their people and resources so that they can continue to exist. Our action centers around one of the largest of these predator cities — London — where we find our hero Tom (Robert Sheehan). He is an archaeologist, meaning he studies “The Ancient Ones” of the 21st century, “The 60 Second War” that created the conditions of their world, where gigantic mega weapons destroyed most of civilization, fractured continents, and nearly wiped out all of humanity. He scavengers through the wreckage of the cities that they pick up looking for artifacts and even fabled weapons so that he can try to destroy them. However others around him may not have such benevolent purposes. A mysterious scarred woman, Hester Shaw (Hera Hilmar) is picked up in the breathtaking opening minutes of the film in one of these smaller cities, and she seems to have a vendetta against one of London’s most powerful residents, Thaddeus Valentine (Hugo Weaving). This begins a chain of events that finds Hester and Tom outside of the city, chased by a sentient skeleton-like robot, picked up by slavers, and fighting for survival. We find out about much more of her backstory and what Valentine is trying to do in London, when she and Tom must work to prevent a repeat of the previous apocalypse. Despite the complexity of that story, the plot is a little thin, it features one of the most obvious mcguffins ever, and at least halfway through seems to give up all pretense of even pretending to not just completely rip-off Star Wars. Again, that wouldn’t be such a terrible thing if this weren’t competing against so many other blockbusters over the next month. However, a lot of the creative and stylistic choices here seem to be made for the entertainment of Asian audiences, (the same way other films like Skyscraper and The Meg were) where this may perform substantially better. It is a really gorgeous film. And unlike some most of Jackson’s recent outings, this does not feel bloated or overwrought. A lot of the credit has to go to director Christian Rivers, a Jackson protoge who worked in the art department and production design for Lord of the Rings, King Kong, and assistant director on The Hobbit films. But Jackson’s fingerprints are all over this, the same way George Lucas will leave his fingerprints on films. It is well-paced and the performances are enjoyable if not memorable. With such a rich tapestry, my biggest complaint is wishing that this film had something important to say about the world. A story about a giant rampaging London consuming other cities could have something very poignant to say about consumption or capitalism competition. Instead it’s just very surface, but you really enjoy all of that extra work put into the design of London or an entire city built in the sky, or other really amazing action set-pieces. This is the same Peter Jackson who brought us Lord of the Rings, but unfortunately he’s not working from a rich world built by JRR Tolkien. This is possibly worth seeing if you love spectacle but care less about story and character and deeper meaning. But there just isn’t much behind the beauty and machinations and technical wizardry of this film. If you do see this, treat yourself to an IMAX or other large-format screen, because at least you can appreciate the art and visuals here. 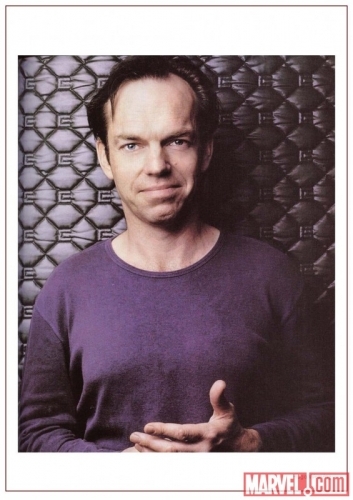 While touring for the release of Cloud Atlas, Hugo Weaving was chatting with Collider in which they asked about his possible return to play the Red Skull, a character he brought to life in Captain America: The First Avenger. It seems the experience didn’t leave that great of an impression for Weaving. Comic Con International in San Diego is almost here and we know you’re going to be spending a lot of time at the Marvel Booth (#2329). And why wouldn’t you be? You’ll have the chance to meet the legendary Stan Lee and a whole host of your favorite superstar Marvel creators like Jeph Loeb, Brian Michael Bendis, and Matt Fraction in person! Marvel always brings the best talent and the biggest announcements to San Diego and this year is no different. So clear those calendars True Believers because Marvel plans on keeping you busy! Between the star studded appearances in the Marvel booth and the Earth-shattering announcements at all the Marvel panels, you won’t have time for anything else! Which superstar creators will be signing? What time will they be there? We’ve got all the answers right here! Stay tuned to www.marvel.com for all of Marvel’s breaking news at Comic Con International in San Diego! Marvel Studios is proud to announce the signing schedule for its two hotly-anticipated blockbuster films, Thor and Captain America: The First Avenger, at Comic-Con International in San Diego! Don’t miss your chance to experience a once-in-a-lifetime event at Comic-Con International in San Diego, courtesy of Marvel Studios on Saturday, July 24th, at the Marvel Booth (#2329)! THOR will come to theatres on May 6, 2011 and CAPTAIN AMERICA: THE FIRST AVENGER will be released on July 22, 2011. Paramount Pictures will distribute both films. Please Note That All Times & Guests Are Subject To Change. The Marvel movie news blog confirmed today that Hugo Weaving will be donning the red mask to play the villain The Red Skull in Captain America: The First Avenger opposite Chris Evans and Hayley Atwell. The movie will be directed by Joe Johnston and was penned by Christopher Markus and Stephen McFeely. In the early comics, Johann Schmidt was drafted into loyal service of The Third Reich and renamed “The Red Skull.” The character will be updated for the feature adaptation. Weaving was last seen in The Wolfman and his voice is very recognizable as Megatron from Transformers and Transformers: Revenge of the Fallen as well as Noah the Elder from Happy Feet. His other film credits include starring in V For Vendetta, The Matrix franchise and The Lord of the Rings trilogy. The film will be released in the U.S. on July 22, 2011 and distributed by Paramount Pictures.